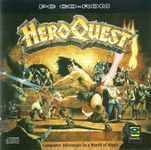 Heroquest is a faithful adaptation of the MB boardgame of the same name. A party of four adventurers (a Dwarf, a Barbarian, an Elf, a Wizard) must complete several quests by exploring dungeons, killing monsters and gathering loot. The gameplay is exactly the same as the boardgame: each adventurer take a turn moving, fighting and exploring the dungeon, then monsters move and fight, then a new turn begins. The quests are the same as in the boardgame. The game includes both an isometric view of a portion of the dungeon, and a global map view. The game can be played with up to four players, since each adventurer acts during his own turn.